For the sheer volume of “trading in the Mediterranean” games out there, it’s surprising that only a handful have tackled the well-documented travels of one of history’s most famous traders – Marco Polo. He wasn’t first to China, nor was he the wealthiest, but over the course of his 24 years traveling between Europe and Asia, Marco Polo recorded countless tales of his travels, including the men he traveled with, the men and women he met on his travels, and everything he found in medieval China. And despite Netflix’s best efforts to convince us to the contrary, it was pretty interesting. 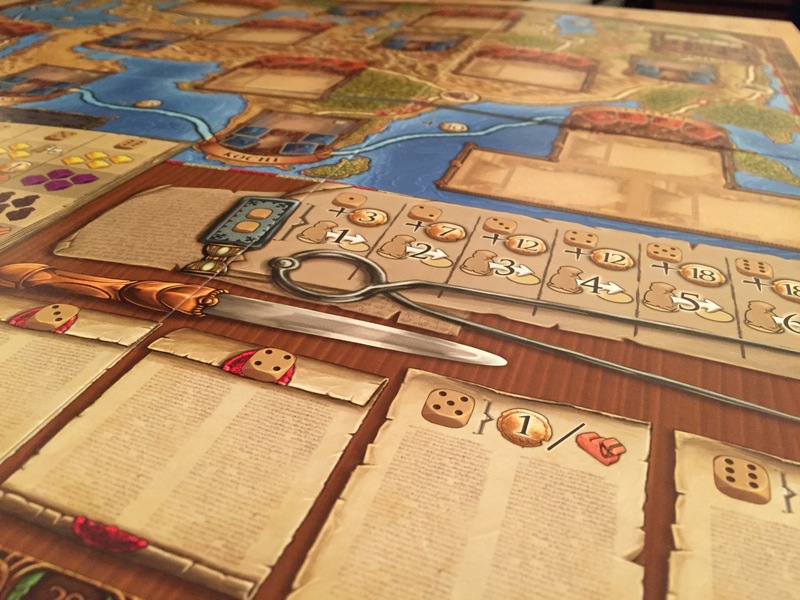 So The Voyages of Marco Polo, the new board game from Simone Luciani and Daniele Tascini – best known for their work on T’zolkin the Mayan Calendar – is a clever, insightful, and resource driven romp through Europe and Asia by way of dice. How does the game stack up to their earlier games? Let’s take a look. The Voyages of Marco Polo was simultaneously manufactured for all markets by Hans im Gluck, and distributed by a number of companies around the world. In the US that company was Z-Man Games, but this is all German quality and attention to detail. The game is dice driven and features a number of unique resources for which there are custom molded tokens. This includes spice, gold bars, silk, and best of all, little orange camels that you’ll be collecting and spending freely throughout the game. 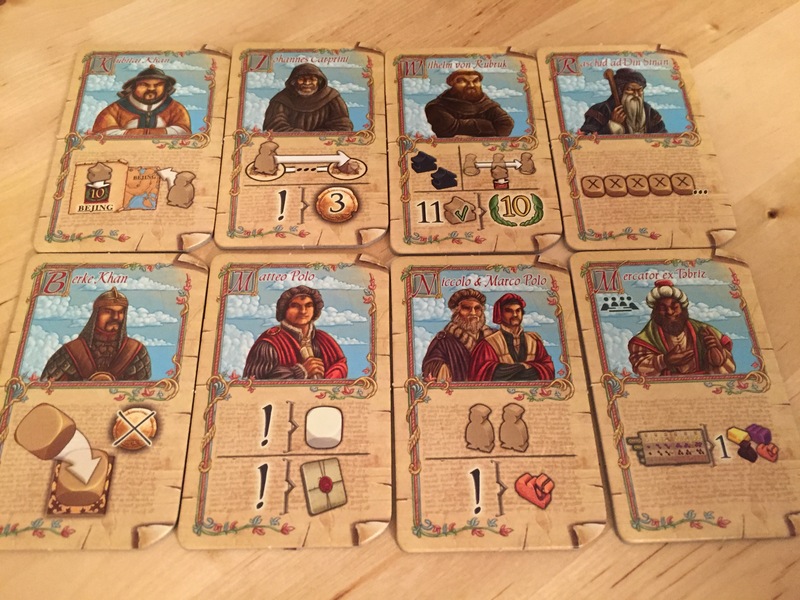 Every player receives a player board of their color with beautiful artwork to match the equally brilliant board, and the dice are well crafted and weighted. Your character meeples are only used for movement and scoring but even here, the publishers have gone the extra mile with trader shaped meeples in four colors. The only real complaint here, because this is a beautiful game, is that the larger tokens meant to represent 3 resources are barely larger than the originals and frequently confused for them – you’d do better to acquire some x3 or x5 tokens for this part of the game. At first glance, The Voyages of Marco Polo looks to have a steep curve. 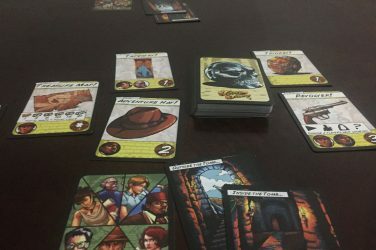 There are numerous action spaces, random elements with the dice, asymmetrical player powers, and a game board that is different every time you play because of the random setup. Fortunately, as complicated as the game looks at first glance, it is actually quite easy to teach. Contracts – You’ll spend resources and camels to complete contracts throughout the game, some of them offering bonuses in coin and other resources on top of the VP you get. Movement – You can unlock victory points through movement by placing trading posts as you explore the game board. This is very hard to do so it’s going to depend on a few factors. Goal Cards – At the end of the game, you will get points based on which cities you visit corresponding to goal cards you receive at the start of the game. Again, very hard to do depending on which character you get. 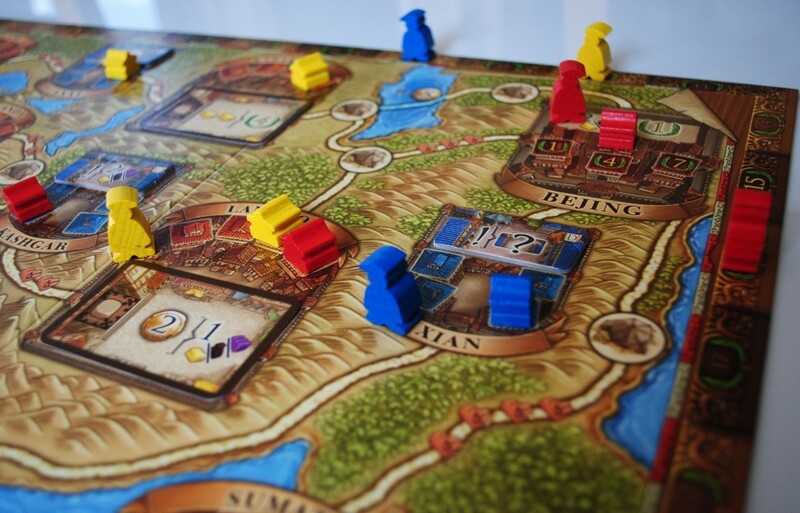 The movement spaces make up the top half of the game board and consist of several cities between Europe and Beijing – each major city has a random one time bonus to the first player who gets there and an action space card that anyone can use once they build a trading post there. The smaller cities have recurring bonuses that you’ll receive when you build your trading post and then every round afterward. They are very good. Better yet, all three of these card types and tokens are randomized at the beginning of the game so there will never be a “good route” you can learn and follow. It’s different every time. The Grand Bazaar – You can spend 1, 2, or 3 dice and purchase camels, spice, silk and gold. The higher the pips on your lowest numbered die, the more you’ll get. Money – There is a space for a single die to snag 5 gold or an unlimited bonus action space for 3 gold. Movement – Movement is VERY expensive in this game. It requires two dice and the more spaces you want to move the more it will cost, all the way up to 18 gold for 6 spaces. Contracts – You can buy new contracts from the bottom of the board. These are relatively cheap but you’ll need to spend a die to do it. Each of these spaces has a die slot and once that die slot has been used by a player, the next player to go there will need to pay extra coin to do so. 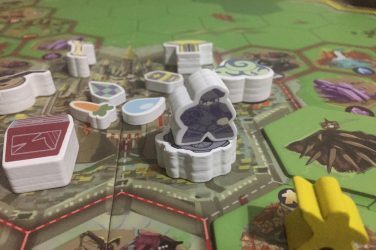 It can get very expensive and so, while it restricts options like any good worker placement game, there are only a few spaces that restrict placement to one player. Finally, the last thing you should review before starting is the player powers. Don’t most games these days offer asymmetrical powers? Yes and some of them do it pretty well, but few do it as well as Marco Polo. This is where the real beauty of this game comes in. These powers are so strong and so seemingly imbalanced that when you see them you’ll find it hard to believe they could possibly work without busting the game. One character can choose any face on the dice at any time. Another never pays the extra cost associated with using a taken action space. Another still starts on the opposite side of the board, which essentially nets them 10 VP for free in Beijing. It’s ridiculous how overpowered these are, and yet they are perfectly balanced. This is the part that requires the most emphasis because players will want to do everything and they can’t. They should build their strategy from the first roll of the dice to match their character. A character with an extra meeple neglecting movement on the board wastes that power. If you haven’t guessed yet, I am a fan of this game. And it’s a good thing too because I bought it blindly, based off of a stray forum thread comparing it in parts to Terra Mystica and Kingsburg. While the comparison wasn’t quite right, the game that I got was equal in quality in many ways to both of those games. 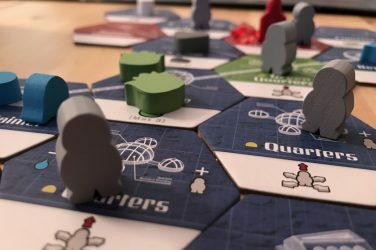 At it’s core, this is a worker placement game, but it does so many things to make the mechanic more unique and randomized to a degree that you cannot find in a straight worker to action space game. 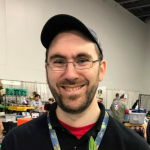 Much like in Tzolk’in, the designers have turned the genre on its head by melding a number of well known mechanisms into one streamlined, extremely well-tested experience. The player powers are the one thing the table tends to spend the most time talking about. They are so powerful and yet so balanced, and because there are 8 of them out of the box, replayability is very high. The deck of action space cards for the board has more than two dozen cards, making it almost guaranteed that every play through will be different, and most of those cards will only ever be available to one or two players. Because payment for an already used action space is based on the pips of your die and because it is completely optional (there are almost always open spaces in this game), you consistently have interesting decisions to make and there are rarely “best options” to draw from. Like any good euro, the game lends itself toward some AP, and it can affect certain players more than others (depending on player power). The character with the option to change any die to a face of their choice tends to take longer to act, if only because they have more options than the rest. This is understandable and adds to the play experience. 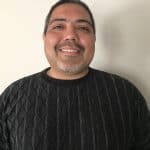 With a group of well-seasoned players who have played it at least twice each, the game will be over in less than 90 minutes and feel like one of the deeper games you’ve played that session. 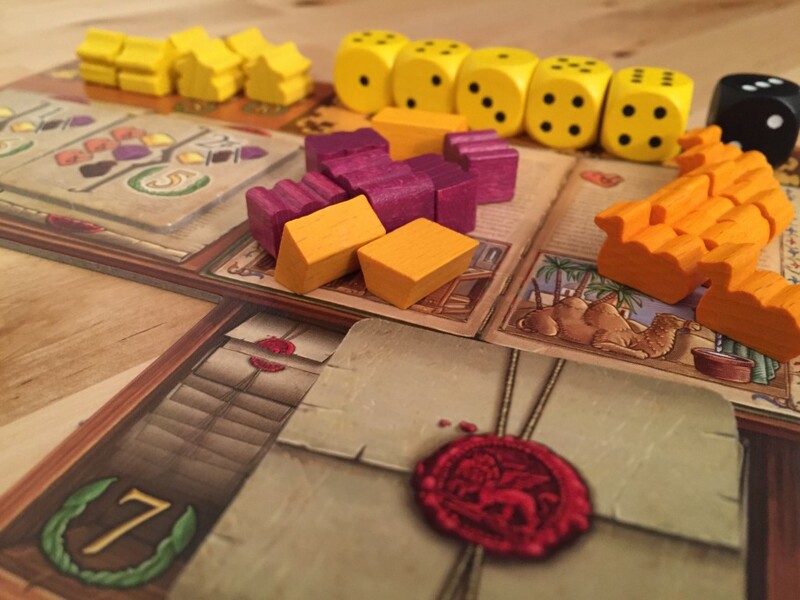 The Voyages of Marco Polo is probably my favorite euro of 2015 and instantly jumped high into my top 50. 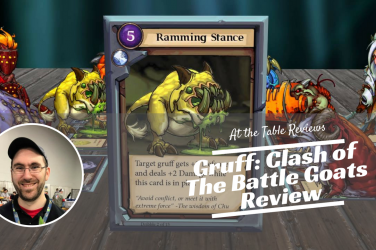 This is a game that I’m subscribed to on BoardGameGeek, not because I want to read other players’ thoughts (though that’s always fun), but because as soon as there is word of an expansion I want it. Heck, I’m just as eager for promos – even one new player power that’s as fun and unique as these will be worth tracking down and getting imported from Germany. The strange thing too is that this game does nothing revolutionary. Every mechanic, every player power, and every moment of play in this game feels familiar in some way. It reminds me a lot of Concordia in this way – it’s brilliant in execution but not revolutionary. That said, the sheer polish and that very brilliance make it a game that does all those things better than most other games that use the same mechanics. There’s something to be said for iterating on and perfecting what’s come before. If you are in the United States, this game is unfortunately out of print right now though Z-Man is working on a new run soon. That said, the game is largely language independent and you can find plenty of German copies in print on Amazon.de or other German retailers. I’ve also recently found copies on Canadian board game websites and the occasional English language editions make it into the United States. 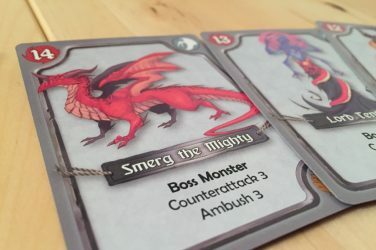 Print the English PDF rules and buy the German version if nothing else – this is a strong buy from me and one of the best games I’ve played in the last year. 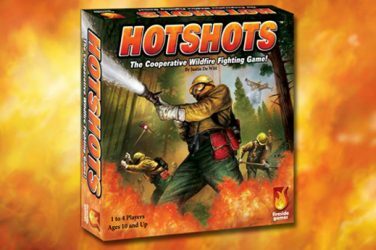 If you enjoy worker placement, dice management, or cool games with unique mechanics, buy this game as soon as you can find it.